To metro Detroiters, the phrase "8 Mile" brings to mind much more than the name of Eminem's 2002 semi-autobiographical film. 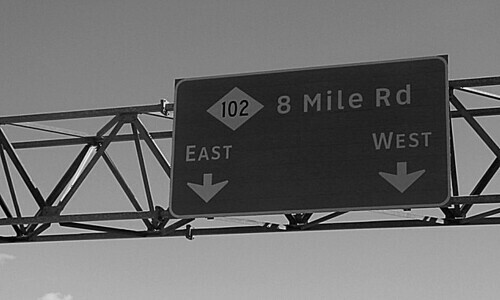 Eight Mile Road represents the separation of white Detroit from black Detroit. South of 8 Mile is mostly African American; north of it is mostly white. Now, with the 2010 census numbers having been released, more and more Detroit residents are leaving the city for the suburbs and other locations. According to recent census numbers, Detroit lost 25% of its residents over this past decade and now claims a population of just over 700,000. "In the early 20th century, however, the city's real estate was valuable, and jealously guarded by whites. The hundreds of thousands of blacks who migrated to work in the city's booming auto and defense industries found that most jobs and neighborhoods were closed to them. In the 1920s, '30s and '40s, working-class white ethnics bought homes and began to identify as just "white." And being white meant keeping blacks, suffering from an extreme housing shortage, away from white neighborhoods and jobs. Along with the restrictive covenants that barred the sale of homes to non-whites and discriminatory public and private lending practice, white Detroiters perpetuated widespread harassment, violence and property destruction against blacks who dared move out of the crowded ghetto in the city's Lower East Side. "For most of the 20th century, Detroit was one of the most segregated cities in the United States," says Tom Sugrue, a professor of history at the University of Pennsylvania and the author of "The Origins of the Urban Crisis: Race and Inequality in Postwar Detroit." "The city became a magnet for black migrants -- and whites fiercely defended their turf against black newcomers." One developer even erected a 6-foot-high cement wall between white and black neighborhoods to make the former actuarially sound. "In many neighborhoods, whites used violence and intimidation to deter black newcomers. In my book, I document nearly 250 incidents involving mobs, vandalism and violence directed toward the first black families to move into formerly white neighborhoods. Whites also formed hundreds of 'neighborhood improvement associations' that pledged to keep 'undesirables' -- namely blacks -- out. Real estate brokers and mortgage lenders -- backed by federal housing policy -- also played a critical role in creating an unfree housing market for African-Americans." With the relocation and decline of industry, blacks were stuck in an increasingly jobless and expanding ghetto. Black unemployment rose to 22.5 percent in 1980, doubling in just 20 years. White workers, writes Sugrue, followed industry to the suburbs. Those too poor to stay behind became "angrier and more defensive." In 1972, every majority white ward in the city supported George Wallace in the Democratic presidential primary. The Alabama governor -- who once declared "segregation now, segregation tomorrow, segregation forever" -- had a message that resonated. The new census numbers show large numbers of blacks moving to the suburbs, and increasing integration as a result: Detroit's dissimilarity index fell a dramatic 10 points since 2000, one of the largest decreases nationwide. This good news, however, is only made possible by the broader economic disaster." What hope does Detroit have for healing and greater cooperation between the city's various ethnic groups? Hopefully, the E.A.C.H. campaign will make a difference. EACH (which stands for Everyone a Chance to Hear) is a collaboration between a number of metro Detroit churches that endeavors to give over 3.5 million people a chance to hear about Jesus Christ and help them take the next steps in their spiritual journey. As Detroit seeks to rebuild itself into a proud city once again, its foundation needs to have a footing of integrity, morality and spirituality. I'm proud to say that both my home church in Michigan, Colonial Woods Missionary Church, and my wife's home church, Royal Oak Missionary Church, are participating in this great effort. If you're a metro Detroit resident and would like to get personally involved in EACH, please talk with your pastor and visit the campaign's website here. Are Professional Athletes Modern-Day Slaves?